This soup is a great alternative to Chicken Noodle Soup. With most recipes, I take the base recipe then play around with it. If you like turmeric or need that added boost, increase the turmeric to 1 tsp. I like to use homemade chicken broth when possible. When I run out, I use chicken bone broth as a way to get in some added protein to the soup. I have made this recipe with regular and light coconut milk. The texture can change a little but both ways seem to be a hit with my family. If you are looking for a way to get in added greens, I add spinach to my soup bowl before I had the soup. The heat of the soup is enough to break down the spinach. This is a great soup to make for your meal prepping day. 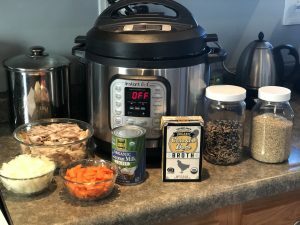 It is short on the prep, you can put it in the Instant Pot or slow cooker and make your second meal of the week.